I am a child of the 80s. Somedays I don't really feel like one, until I see a headline like this in USA Today. 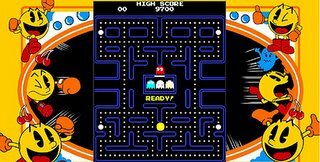 : "Pac-Man" is going digital. I'm really not good at video games. In fact my brothers would tell you I am down right lousy at them. But I love Pac-Man. Could slide all kinds of quarters into the arcade slots to play that game. And now it looks like you can download it for a small fee. Just what I need! Another excuse to procrastinate. On another light note, Starbucks is adding books! I'm not a big coffee drinker -- shocking, isn't it. I like my caffeine the cold way, in a Dr Pepper. But I do like an occasional mocha cappucino. Starbucks has always been a great place to meet freinds and chat. Now they're making it even more book freindly by selling books. They're starting with a Mitch Albom book. 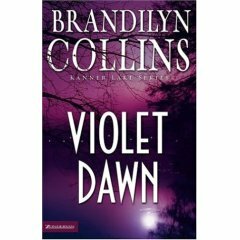 Finally, if you've been waiting with bated breath to read Brandilyn Collins' new book Violet Dawn, you don't have to wait any longer. It should hit bookshelves any day. Run -- do not walk -- to get your copy. I thorougly enjoyed her seatbelt suspense in this book. You can check out more of my thoughts at e-opinions. I'm the caracp review. Hello Cara, I saw your comments on Tricia's blog and thought I would pop over and say, "hello." I may have to look for that book at our local library. Thanks for joining us, Leticia. You should definitely look for Violet Dawn at your library, and if they don't have it ask them to purchase it. It's wonderful!